Internet of Things (IoT) is a paradigm that considers pervasive presence in the environment of a variety of things/objects that through wireless and wired connections and unique addressing schemes are able to interact with each other and cooperate with other things/objects to create new applications/services and reach common goals. The Internet of Things applications drive the intelligence to the edge of the system by sensing/actuating the environment using intelligent sensors/actuators (analog and digital) that are communicating using IP to improve performance and efficiency by collecting and processing the information and coupling massive sensing and control with big data and analytics to accomplish advanced levels of optimization and efficiency. The IoT makes use of synergies that are generated by the convergence of consumer, business and industrial internet consumer, business and industrial internet. The convergence creates the open, global network connecting people, information, and things. This convergence leverages the cloud/fog to connect intelligent things that sense and transmit a broad array of data, helping creating services that would not be obvious without this level of connectivity and analytical intelligence. IoT applications are combining real-time sensing, data delivery, big data intelligence, application of insights through real-time actuation. This new era of communication and processing redefines the notions of real-time IoT, 5G mobile communications systems and Smart Big Data. IoT applications make use in the future of heterogeneous networks using different kinds of radio access nodes, which are placed according to the needs of the field. Such networks need to improve cellular coverage, capacity, the global throughput, use technologies that enables low latency, real-time bandwidth, and advanced packet priority management, achieving higher throughput and less jitter, while enhance the user experience. The emergence of industrial IoT connecting actuating robots, haptic computing, energy and vehicles through the inclusion of the next generation networking capabilities is one of the elements that highlight the convergence and integration of mobile communications, Internet, and big data processing in realizing diverse applications of IoT. The IoT offers the enabling technologies for implementing a smarter grid to enable more information and connectivity throughout the infrastructure to buildings, vehicles and cities. Through the IoT, consumers, manufacturers and utility providers reveal new ways to manage devices and conserve resources and save money by using renewables, energy storage devices, smart meters, energy gateways, smart plugs and connected appliances. The reflection of the IoT into the energy domain is represented by the Internet of Energy (IoE), concept that provides innovative ways for power distribution, energy storage, grid monitoring and communication. It allows units of energy to be transferred bidirectional when and where it is needed. Power consumption monitoring is performed on all levels, from locally individual devices up to national and international level. The IoE provides to the consumers a highly reliable, flexible, resilient, efficient and cost effective power supply network, in particular enabling the full deployment of distributed power sources (i.e. small scaled renewable sources) in combination with large centralized generators. In this context the IoE is defined as an energy and data/information network infrastructure based on standard and interoperable communication transceivers, gateways and protocols that allow a real time balance between the local plus the global generation and storage capability together with the energy demand, creating a high level of consumer awareness and involvement. 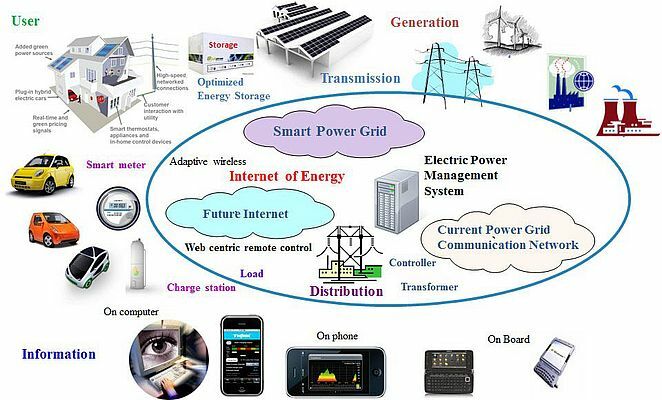 All of these are used in the context of active and dynamic interaction on the smart grid with electric vehicles as both consumers and energy storage units. IoE integrates a number of key functionalities such as: advanced metering infrastructure; demand-response; electric vehicles; distributed energy resources and storage and, distribution grid management. In the future smart grid age, it is most likely that the responsibility for power quality (frequency, voltage, harmonics) and power network stability will remain with the power network operators (i.e., Distribution System Operators, Transmission System Operators). However, electricity consumers/prosumers like buildings will become "smart" with respect to their electric power consumption. The IoE concept opens for the development of future Smart Grid deployment and the integration of Energy Cloud, Energy Hub and Energy Storage Cloud concepts. The Energy Hub is combining charging stations, improved operating efficiencies, cost savings, accelerated fault finding and better power quality, as well as how to facilitate the integration of renewable and distributed generation sources in the city context using micro/nano grid deployments and cloud energy source distribution. New requirements for power matching are defined for operating its micro/nano grid systems that incorporate the necessary flexibility to accommodate inherently intermittent renewable technologies, such as wind and solar. The concept of IoE applies for the implementation of the energy cloud that means a paradigm shift from the centralized energy generation and distribution architecture toward a networked and dynamic infrastructure that incorporates demand based hybrid generation technologies and capabilities using renewable energy sources combined with other types of energy sources. The exploitation of IoE results to this new type of complex and redundant ecosystem integrates multiple inputs, stakeholders and users relying on a high degree of digitalization and communication to support two-way energy flows. This allows for greater choice on how energy is generated, supplied, and consumed. The IoE architecture allows the integration of energy cloud with the concepts of micro/nano grids. Energy Storage Cloud allows the seamless integration of local and mobile energy storages (distributed energy banks - stand alone or part of the buildings/homes/parking/poles infrastructure, second life battery packs, dynamically generated battery banks-fleet of vehicles connected when charging or when parking) into so called Energy Cloud using the communication interface and moving toward energy as a service implementation. 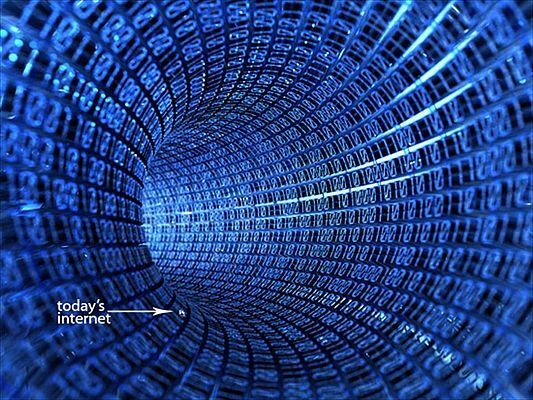 The IoE exposes opportunities for innovative services which build on the computational power and scalability of the data cloud and the control of the bidirectional behavior energy cloud, along with the collective consumer/prosumer knowledge. Data which is aggregated then stored within the data cloud and the energy which is transferred and stored in the energy cloud can provide dramatic new insights about consumer/prosumer needs and behavior.